CalProg is pleased to announce (finally!) 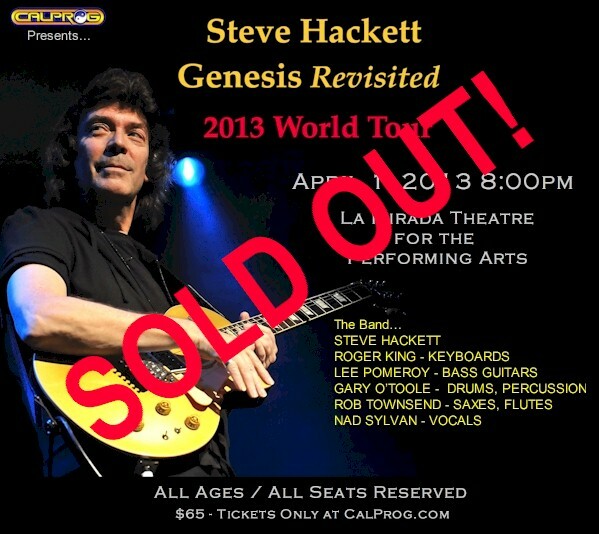 that Steve Hackett will be performing the ONLY southern California show of "Genesis Revisited" with us, at our La Mirada venue on Monday April 1, 2013. Steve first received international notoriety as the guitar player for Genesis back in the early 1970s. He is still considered a pioneer as he was the first to demonstrate that guitar in a rock band need not be relegated only to chords and blistering lead lines (although he is a master of both). Instead he used the guitar to weave ambiance and texture into the fabric of the music that was so often focused on the keyboard work of Tony Banks and the theatrical vocal delivery of Peter Gabriel. He helped shape the sound of Genesis that made them one of the most important bands in the history of progressive rock. In this show he will return to the roots of Genesis music, and perform the material that prog fans have been dying to hear live, instead of the pop-oriented songs that Genesis featured in their latter tours, with the prog material buried in a "nostalgia medley". If you were a fan of Genesis the PROG BAND this is a dream come true. If you're skeptical, by all means visit our web site and listen to the audio sample I've assembled from the new double CD that this tour is supporting "Genesis Revisited II". His latest album basks in the title of ‘Genesis Revisited II’. A follow-up to 1996’s ‘Genesis Revisited’, as the title suggests, it sees the guitarist reinterpreting the golden era of the great band - one in which he was crucially involved – while also remaining true to the original spirit which produced such a remarkable string of timeless songs. This will be a double CD, as well as a quadruple set on vinyl. That’s nearly 150 minutes of music – “It’s a project of Wagnerian proportions!” says Hackett. Tickets are on sale ONLY at the CalProg site (you can't get them from the theater box office) now. You will need a credit card or a PayPal account to make the purchase. CalProg has been extremely fortunate to present some incredible shows over the last 10 years, but I don't know if we've ever been more excited about any of them as we are for this one. For me personally GENESIS was my favorite prog band, and their music embodies all of the aspects of progressive rock that I hold sacred. To hear their music performed by an original member of the band with the care and reverence he obviously has for it is more than I ever expected to witness again. But here it is! Someone pinch me!!! I hope you join us in this celebration of timeless music. And please, tell your friends!